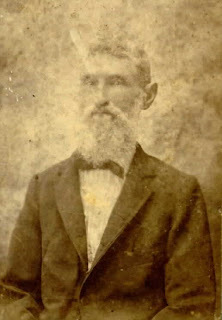 Gadson Humphreys Sanchez (1832-1926) is one of Francis Roman Sanchez' sons. The image comes from one of George W. Sanchez' descendants. During the Civil War he enlisted in the First Florida Infantry, Company K (Pensacola Guards) on 2/8/1862 in Waldo. He was promoted to 2nd Corporal on 12/1/1862 and 1st Corporal in early 1863. He was absent sick since 8/30/1863 at Montgomery, AL. He is listed as a prisoner on boarded the USS Sagamore in March 1864. He applied for a Confederate Pension (A6195). You can see and download a copy the his pension application file from the State Archives. I have Gadson's death reported in Brunswick, GA and also in Newberry, FL. Can someone help? Put it in the comments. May be the death and the burial are being confused in the records, I don't know.